This took longer than expected. As I mentioned in my last post, selections this year were hard. 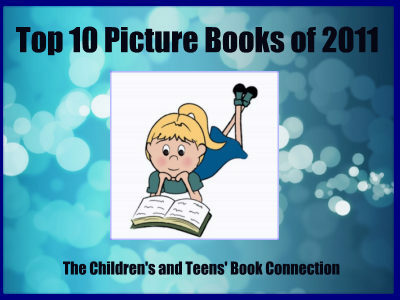 In addition, I discovered I needed to segregate picture books for little kids (babies, toddlers, preschoolers) from those for school-age children. While some books could overlap between the two age groups, there was no way for me to compile a fair list if I lumped them all into one group. For books where I couldn’t find an age listing, I put them where I felt they fit best. I’ll start off with my Top 10 for the youngest category and then list the Top 10 in the older category. There are repeat names on this list, but I felt these authors and publishers truly knew how to create books attractive to this market. 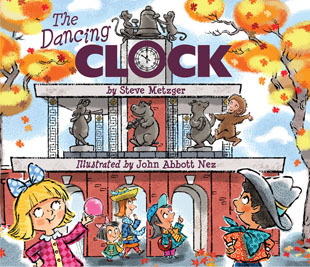 A fun rhyming tale that celebrates a famous landmark is what you’ll find in The Dancing Clock by Steve Metzger. Every hour the Delacorte Clock in Central Park chimes and the merry band of animals performs for the crowd. From his home in the zoo, Milo the monkey wants to join in and do the dance, but his friends just want to play. When the zookeeper forgets to the lock the gate to the monkey house, Milo sets out on his adventure and learns a great lesson too. From the author of The Ice Cream King, comes a rolicking, rhyming story of one monkey’s adventurous trip outside his home. This is a splendid story that your three- to seven-year-old is sure to enjoy. Just as imaginative as Metzger’s The Ice Cream King, The Dancing Clock will captivate readers with its rhymes and wonderful artwork. John Abbott Nez is the artist for this one. I don’t recall ever seeing anything else by him, but I would definitely be on the lookout for more books he’s provided artwork for. He captures New York City and Central Park so well. We just visited the city last weekend, so I felt right at home as I scanned these illustrations. I don’t often comment on book design or fonts, but I liked the total package here. The inside front and back covers contain illustrations from inside the zoo, including the Delacorte Clock. The selected font (I’m not cetain what it is) adds to the whimsy of the story. The final page of the book includes facts about the Delacorte Clock, which parents will like, and kids will find fascinating. I highly recommend The Dancing Clock by Steve Metzger and look forward to his next book. I received a free copy of this book from the publisher in exchange for my honest opinion. I received no monetary compensation for this review. 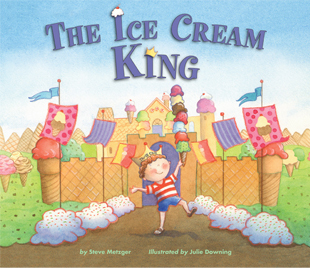 A magical story of ice cream fountains and volcanoes that erupt with vanilla fudge awaits your child in The Ice Cream King by Steve Metzger. Teddy and his mom visit the new ice cream shop in town. The server puts a paper crown on Teddy’s head and he is transformed into the Ice Cream King who can have anything he wants. Slipping down Whipped Cream Lane and climbing up Ice Cream Mountain is great fun, but even with all the wonderful things in his ice cream kingdom, Teddy discovers something is missing. What a fabulous way to teach children about sharing. This charming book uses imagination to show kids that having wonderful things is great, but everything is much better when you have someone to share with. I have mixed feelings about the artwork . The opening pages are pencil drawings with a minimum of color. Then once we are in Teddy’s imagination, the illustrations become colorful like the cover art. Once Teddy leaves his dreams behind, the illustrations switch back to the pencil drawings. I’m guessing this was done to make it easier for readers to differentiate between fantasy and reality. Julie Downing is very talented and her artwork beautiful, I just didn’t care for changing styles in the book. The Ice Cream King is a delightful story that celebrates creativity and imagination. While my daughter and I knew the ending before we turned the last page, it was great to see Teddy come to the realization that he did. Kids will enjoy this one.